Insurance is one of those things that helps us sleep better at night (even if it isn’t fun paying for it). Knowing that we are protected in times of need is a comforting feeling, and if your goal is to work in this industry, having an awesome resume is invaluable. Our insurance agent resume example and writing tips can help you land the job — which should help you sleep better at night as well! However, if you are running out of time, try out our free, easy-to-use resume generator to create a resume in minutes. We have more sample resumes organized by industry for your convenience. 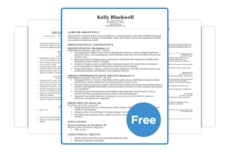 Find the most fitting format amongst our assortment of free resume templates. Ready to move on? Check out our expansive cover letter collection for the tips you need to create a winning cover letter. 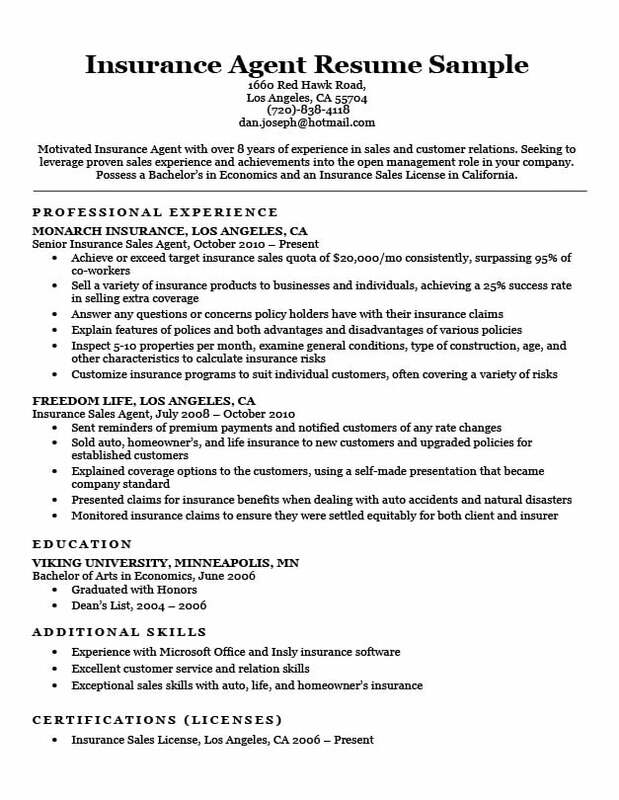 Motivated Insurance Agent with over 8 years of experience in sales and customer relations. Seeking to leverage proven sales experience and achievements into the open management role in your company. Possess a Bachelor’s in Economics and an Insurance Sales License in California. There are two general categories of insurance agent resumes, and knowing which category yours falls into is key before starting the writing process. Depending on whether you aspire to be an independent agent or work for a big company, you will be composing a slightly different one. The resume of an independent insurance agent will have a more managerial/entrepreneurial flavor; whereas working for a firm will have a more productivity/sales emphasis. Making your area of focus stand out will help you make a positive impression on a hiring manager. The reasoning here is simple. Independent agents are more like entrepreneurs in terms of managing budgets & rent, and are directly responsible for any growth in sales or business (a genuine one-man-band). 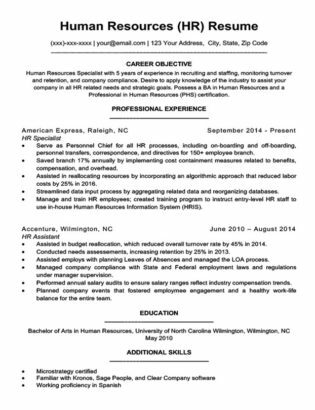 An insurance agent working within a larger firm will write a resume similar to one found in the service industry. The emphasis here will be on how you contributed to the company as a whole, instead of as an individual. 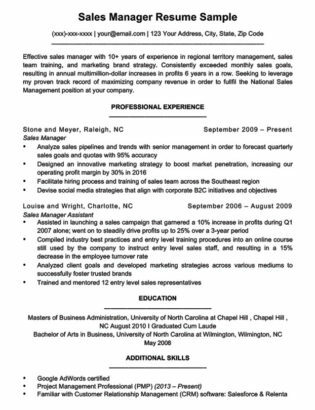 Check out how our insurance agent resume example highlights the applicant’s positive affect on each company (both past and present). He makes it explicitly clear that his expertise lies within the realm of large-firm insurance. Making your area of focus stand out will help you make a positive impression on a hiring manager. 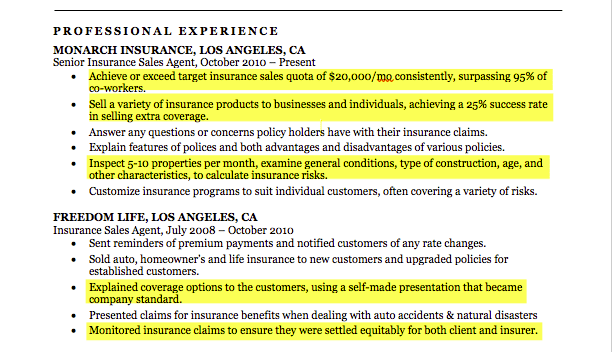 The career objective section in an insurance resume should target the specific job opening you’re applying for. If you want to send out multiple job applications, that’s fine! Just remember that each career objective should be tailored to “respond” to that specific position. Below, we’ve included a picture of a sample insurance career objective. You don’t need to write a great literary work here. Just sell your potential worth to the employer in a concise fashion, and you’ll be getting interview calls before you know it. If you worked independently in the past, make sure to emphasis management of expenses, record keeping, and revenue growth. If you’ve worked in the insurance industry before, you probably have experience selling insurance policies. At your company, there might be a way of finding out what the average sales are for someone in your position. If you managed to sell more than the average, you should definitely include that kind of important information. Did you come up with a new sales method that was highly successful for yourself? Did you teach that method to others? Were they successful? How many people did you teach the method to? Have you trained new salesmen? How was the retention rate? H0w many projects did you lead? Were they successful? Have you helped your company surpass monthly, bi-annual or annual sales goals? By answering any of these questions in a positive way, you’re including concrete, quantifiable information. Hiring managers are on the lookout for such content, so the more you have the better your chances of moving to the next stage of the hiring process. If you worked independently in the past, make sure to emphasis management of expenses, record keeping, and revenue growth. These are all achievements unique to an independent agent, and look very impressive on a resume being presented to an agency. Selling insurance isn’t a walk in the park. Employers will be looking for applicants who have skills that align with someone who can thrive in sales. It takes a set of both hard and soft skills to succeed in this industry. If the writing process is still unclear, our how to write a resume guide can help you get started. Or if time is of the essence, our resume generator can help you build one in minutes.